We all need to get fit and stay in shape, and convenience plays an ever increasing part in such a fast paced and very hectic world. Here’s one answer many health conscious people are going to absolutely love – introducing, the 360gym. SPORTING CLUBS: Strength and conditioning programs can be conducted alongside speed and agility drills for a more complete and intense training experience. 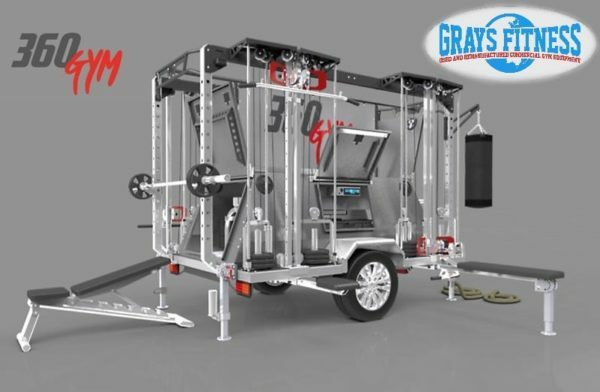 The portability coupled with the large storage capacity of the 360gym means gear can be carried onto the oval, set-up quickly and various circuits can be conducted. This avoids repetitiveness and ensures training sessions remain interesting and motivating week in, week out. PERSONAL TRAINERS: 360gym comes as a ready-to-train package that allows you to offer numerous styles of outdoor training including strength training, circuits, functional, HIIT and more. With more storage, more equipment and more exercises at your disposal, building effective and enjoyable programs will be easier than ever before. HOME GYM: Sick and tired of driving to the gym? The 360gym is an excellent option for fitness enthusiasts of all levels. With the ability to be used at home or your preferred location, the 360gym offers a compact and complete fitness solution. Train with friends or in privacy, when and where it suits. Some of what you get! Buy 360Gym online. If you are interested in the 360Gym for sale, feel free to enquire above.